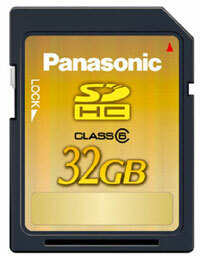 Panasonic has just released its new SDHC (Secure Digital High Capacity) 32GB card for consumer electronics market. Although it is not the first 32GB SDHC card to the market, but it is currently the fastest SDHC card that is compliant to Class 6, capable of achieving 20MBps maximum data transfer speed targeted for HD (High Definition) media recording. SDHC is an extended version of existing SD card standard which allows higher capacity support exceeding 2GB. In order for more data to be transferred in shorter time frame, the sustaining transfer rate becomes crucial as no one is willing to wait for an hour just to backup all the data from SD card into hard disk for storage. That is how the class definition comes into the picture. SD Association has come out with classes so that the SDHC can be categorized based on its read/write speed performance, with Class 2 and 4 commonly available in the market place and Panasonic be the first to offer Class 6 at this moment. Theoretically, 32GB memory card can store up to 12 hours of High Definition video with 1440 X 1080i resolution, and approximately 4 hours of Full High Definition video with 1920 X 1080i resolution. The SDHC card will be available in first half of 2008. Retailed at $699, it is quite expensive for average users.